Robot Unicorn Attack is an online "endless running" video game featured on the Adult Swim and Flashline Games website. The game was produced by American studio Spiritonin Media Games and was released in February 4, 2010. The game's soundtrack is the 1994 song "Always," by the British band Erasure, in its "2009 mix" version. A third was released titled Robot Unicorn Attack 3 for iOS on April 27, 2017. The Robot Unicorn approaching a star. Due to the game's popularity, Adult Swim released Robot Unicorn Attack T-shirt; this was the first time Adult Swim had released game-related merchandise. In June 2010, it was released for iOS, and in August, the game was released on Facebook, making it the first time an Adult Swim game had been ported to Facebook. In the following month, a Robot Unicorn Attack hoodie became available. In October, a high-definition version of Robot Unicorn Attack was released for the iPad. On April 19, 2011, the game was released for Android. In October 2010, Adult Swim Games released Robot Unicorn Attack: Heavy Metal, an alternate version of the game featuring different visuals and music, for iPhone, later publishing it to Adultswim.com as well on November 19, 2010. The game features the song "Battlefield" from German power metal band Blind Guardian. The game's presentation is influenced by depictions of Hell as well as glam metal. [original research?] It received an even better score on their website than the original. In January 2011, Robot Unicorn Attack: Heavy Metal was made available on Facebook alongside its original counterpart, as a single application. On November 23, 2010 Adult Swim released a Christmas-themed version of Robot Unicorn Attack on iTunes, entitled Robot Unicorn Attack: Christmas Edition. The game features "Christmas Time (Don't Let the Bells End)" by The Darkness. 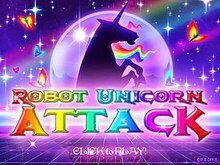 Robot Unicorn Attack: Christmas Edition was released on Adultswim.com in November 2011, despite reports to the contrary. Robot Unicorn Attack Evolution plays identically to the original, but after three stars are broken in a row (four in a row in the Facebook version), the Robot Unicorn evolves into other robotic creatures. There are also multiple fairies per platform. In the Facebook version, the player must keep breaking stars in order to transform to the next animal; missing a star will cause the animal to revert to the unicorn. Retro Unicorn Attack, a version of the game styled after popular video games in the 8-bit era, was released in 2013. A sequel titled Robot Unicorn Attack 2 was developed by PikPok and released on iOS on April 25, 2013, and Android on July 12, 2013. This sequel expands upon the original's template by adding new maneuvers like the "Rainbow Savior" and "Gallow's Gallop." It also introduces enemies, missions, and the option to customise your unicorn's appearance. The game also introduces the ability to fly by equipping wings that can be unlocked in-game. The core gameplay and controls remain the same as in the original browser game, but the game also adds a number of new features. [original research?] The player can collect teardrops that can be used to customize their character. Missions can be completed to unlock new content and abilities. The game also adds enemies, including giant golems. Egyptian- and medieval-themed unicorns were introduced in an update, as well as the new threat of solar geysers. The visuals also received a makeover. The unicorn itself is much more detailed and fluid, and the painted backgrounds also have much more depth and detail. The newest update introduced a Celestial Unicorn, as well as a new Lava course available for purchase with real-world currency. This is the first Robot Unicorn Attack to include in-game purchases; the player can buy credits to upgrade his or her unicorn and additional sound-packs. Erasure's seminal song "Always" – which was a main part of the original game – is not part of the default package and must be purchased separately for $0.99. "I will never be able to separate Always from Robot Unicorn Attack," wrote Kieron Gillen in 2010. "I can't even imagine wanting to do such a thing. It'd be like decapitating the Mona Lisa. It merges with the sparkles of sound effects and the explosions of light and makes it complete." The song is not included with the base game due to copyright, and as Adult Swim wanted the game to be free-to-play, it was made into an in-game purchase. Other songs by such bands as Blind Guardian, Slade, Limahl, and Corey Hart are also available for purchase. Combining the game with the internet meme, Nyan Cat (involving a cat with the body of a Pop-Tart flying through space and leaving a trail of rainbows), a parody game called Nyanicorn was created that mimicked the style of Robot Unicorn Attack, including the gameplay. There is also a fan-made version called "Rainbow Dash Attack", where the eponymous Robot Unicorn is replaced by Rainbow Dash, a pegasus character from the series My Little Pony: Friendship is Magic. Rainbow Dash is known to draw a trail of rainbow mid-flight, similar to the Robot Unicorn. Ivan Williams of 1UP.com stated that, "Whether it's the song constantly on an [sic] loop or the simple desire to get a better score than the millions of other gamers playing, I challenge anyone to play Robot Unicorn Attack and not have that game pop into your head every now and then." In reviews of the major flash games of 2010, Eurogamer writer Kieron Gillen said, "Like a comet made of gold, glitter and Lady Gaga's eyelashes, Robot Unicorn Attack circled the Earth and filled the firmament with its irresistible radiance for the whole of 2010. It changed lives. It challenged sexualities. It involves pressing two buttons. It is undoubtedly the greatest game of all time which features a Robot Unicorn, unless you're a metalhead who digs its sequel." Scott Sharkey of UGO Networks said that while "the aesthetic is a good gag for a few minutes", the important point of Robot Unicorn Attack is that "the game itself is addictive enough to last much, much longer. At least, until someone catches you playing and ribs you about it for the next week or so." Neon Kelly, Previews Editor of VideoGamer.com, concluded after playing that "Somehow the whole thing ends up being extremely addictive - despite the fact that the game's tongue is so firmly wedged in its cheek that it's in danger of giving itself permanent facial damage. If you've not yet done so, I heartily urge you to go try it." Toby Green of The Independent wrote in a short review that the game was "Great fun", giving it four out of five stars. In a review of the iPhone version of the game, CNN writer Topher Kohan concluded, "Easy-to-use controls, great soundtrack, the ability to turn the sound off and get useful feedback via vibrate and fun in-game tidbits. This feels like a game you'll put on your phone, then pull out to play again and again." In a twin review for the Australian Broadcasting Corporation by reviewers Stephanie Bendixsen ("Hex") and Steven O'Donnell ("Bajo"), Hex finished by saying, ""This game is utterly riDONKulous, so I'm giving it the utterly ridonkulous score of 8971. I can't wait to press Z to chase my dreams again", to which reviewer Bajo responded, "I'm not sure how to score it after that." ^ "Robot Unicorn Attack v2". Adult Swim / [bumpworthy]. February 22, 2010. Retrieved July 10, 2011. ^ a b Kieron Gillen (December 30, 2010). "Games of 2010: Robot Unicorn Attack". Eurogamer. Retrieved April 3, 2011. ^ "Robot Unicorn Attack 'Chase Your Dreams' Shirt — Adult Swim Shop". Archived from the original on April 27, 2010. Retrieved September 23, 2010. ^ "Robot Unicorn Attack 'Chase Your Dreams' Ladies Shirt — Adult Swim Shop". Archived from the original on December 1, 2010. Retrieved September 23, 2010. ^ "Adult Swim: iPhone Games - Robot Unicorn Attack". Retrieved September 23, 2010. ^ Kieron Gillen (September 20, 2010). "Poke Me: Facebook Robot Unicorn Attack". Rock, Paper, Shotgun. Retrieved April 3, 2011. ^ "Adult Swim : iPhone Games - Robot Unicorn Attack - Heavy Metal Edition". Games.adultswim.com. Retrieved December 26, 2010. ^ "Robot Unicorn Attack Christmas Edition for iPhone, iPod touch, and iPad on the iTunes App Store". Itunes.apple.com. December 20, 2010. Retrieved December 26, 2010. ^ "iPhone Game: Robot Unicorn Attack Christmas - Adult Swim Message Boards". Boards.adultswim.com. Retrieved December 26, 2010. ^ "Robot Unicorn Attacks Christmas". Kotaku.com. November 22, 2010. Retrieved December 26, 2010. ^ "Robot Unicorn Attack Christmas". games.adultswim.com. Retrieved November 20, 2011. ^ "Re: iPhone Game: Robot Unicorn Attack Christmas - Adult Swim Message Boards". Boards.adultswim.com. Retrieved July 4, 2011. ^ "Robot Unicorn Attack 2: EuroGamer review". April 27, 2013. Retrieved April 27, 2013. ^ "Robot Unicorn Attack 2: The Verge.com review". April 27, 2013. Retrieved April 27, 2013. ^ John Funk (May 26, 2011). "Nyancat and Robot Unicorn Attack Now Live in Harmony". The Escapist. Retrieved June 4, 2011. ^ Maurice Tan (May 27, 2011). "Nyanicorn is exactly what you think it is". Destructoid. Retrieved June 7, 2011. ^ Sethisto (May 13, 2011). "Game: Rainbow Dash Attack". Equestria Daily. ^ "Robot Unicorn Attack for iPhone/iPad Reviews". Metacritic. CBS Interactive. Retrieved July 14, 2018. ^ "Robot Unicorn Attack Heavy Metal Edition for iPhone/iPad Reviews". Metacritic. CBS Interactive. Retrieved July 14, 2018. ^ Hodapp, Eli (June 2, 2010). "'Robot Unicorn Attack' Dashes (With Rainbows) on to the App Store". TouchArcade. Retrieved July 14, 2018. ^ Ivan Williams (February 27, 2010). "Dual Review: Canabalt and Robot Unicorn Attack". 1UP.com. Retrieved April 3, 2011. ^ Scott Sharkey (February 12, 2010). "Recession Gaming: Human-Robot Unicorn Edition". UGO Networks. Archived from the original on March 29, 2010. Retrieved April 3, 2011. ^ Neon Kelly (June 6, 2010). "Robot Unicorn Attack, iPhone". VideoGamer.com. Retrieved April 3, 2011. ^ Toby Green (June 25, 2010). "Games review: Robot Unicorn Attack". The Independent. Retrieved April 3, 2011. ^ Topher Kohan (June 18, 2010). "Review: Adult Swim's 'Robot Unicorn Attack' a dream". CNN. Retrieved April 3, 2011. ^ Hex; Bajo (May 24, 2010). "Robot Unicorn Attack". Australian Broadcasting Corporation. Retrieved April 3, 2011.